Jixing Yin, OMD., MD. (China), Licensed Massage Therapist in Washington State (LMP). Born into a family of Traditional Chinese Medicine (TCM) doctors, Jixing is a third generation Chinese medical doctor in his family. He began his studies of Chinese Medicine at the age of sixteen by following his father, Dr. Zixu Yin, who specialized in internal medicine, pediatrics, gynecology, sports injury, trauma and osteology of Chinese medicine. 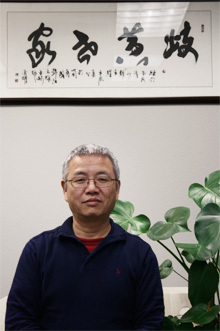 Jixing grew up reading Chinese medicine classics and masterpieces, where he learned TCM theories and philosophy which enriched his later practice. Jixing graduated from the Chengdu University of Traditional Chinese Medicine (TCM) which is one of the most prominent TCM medical schools in China. After graduation, Jixing completed his residency at the Affiliated Hospital of Chengdu University of Chinese Medicine. Before moving to the U.S. Jixing practiced in Chengdu, China, for over two decades through his family-oriented clinic which integrated Western and Chinese medical practice. He was able to cure a variety of complicated conditions as an internal medicine, osteology and traumatology practitioner. These included a variety of cases of chronic and complicated conditions, including those with traumatic injuries and sports injuries. He has helped numerous patients with severe vertebrae compression fracture. Jixing has been practicing in Greater Seattle for over ten years using therapeutic massage, acupressure, and wellness suggestions based on Chinese herbal internal medicine. He has helped patients referred to him for problems with chronic and acute sports injury, auto accident injuries, labor and industrial injuries, pain and swelling in extremity joints, muscular strains and stiffness, cervical syndrome from prolonged use of computers including headache, neck pain, thoracic, shoulders, back and lumbar numbness in upper extremities with a limited range of motions. Jixing has worked with professional athletes and high-profile clients providing Swedish, deep tissue and trigger point therapy. He is also specialized in wellness massage for general malaise, insomnia, fatigue and tiredness due to stress from work or study, from which his clients commonly gain positive results.